Yes, I agree with you on the fritters. I was also impressed by the service, and the hollandaise was not at all overpowering. Mention must be made of the toast that was a very flavoursome sourdough. I guess Mart has a certain Gay cachet, as Adam Elliot is the boyfriend of one of the proprieters. Tara is one of the many locals who have defected from the usual Armstrong Street haunts, which were beginning to lose their sheen. Some love it's proximity to the local adventure playground too. Don't you just love the ramp to the hidden carpark servicing the bowls and tennis clubs? I wonder what will happen to the venue during the Grand Prix? Will it be hermetically sealed from GP Hoons, or will the corporates snap up the venue as a branding opportunity? Thanking you for your recommendation, which was followed to the letter on the weekend. Mmmmmmmm, corny goodness. Being of a pooch-owning prediction, I also liked their trackside dog-friendly area where the hound could watch the trams go by. Congratulations to the whole team, especially the cute little food fairy(chef)named Bel. Just wolfed down the blackboard special: 'Green eggs and ham'. Perfectly toasted sour dough smeared with exceptional pesto, topped with perfectly poached eggs and delicate smoky ham. We noticed the black board menu only features poached eggs, and a friend was resigned to the fact until he saw two serves of steaming scrambled eggs arrive at the communal table. Trouble is, when his brekkie arrived, he bolted his scrambles - with asparagus etc,etc - down so fast we couldn't get our forks in for a try!! Dan, Stewart and the team have done a great job ... food and follies are fab. Stewart makes the best soy chai lattes! Oh how poofy! Off to Sydney on the weekend J ... ashamed to ask ... Bill's? We had a fantastic late breakfast at Mart today, which was sorely needed after a very late drinking session that stretched well into the wee hours of this morning. In my hung-over haze it took me a while to realise that Mart is simply tram backwards, how clever I thought. Good thing the missus was driving this morning. Coffee was good and the breakfast even better. I settled for the scrambled eggs on sourdough with the vegetarian sides (yes I know eggs are not vegetables so forgive the misnomer that I ordered a veg breakfast, but couldn't stomach the bacon) which were spinach and mushrooms. This also came with a serving of hollandaise. The breakfast was fantastic. The eggs were exactly to my liking; spinach was awesome and nice mushrooms. Hollandaise was surprisingly mild, but added a nice zest to the meal. Outstanding toast, well buttered. 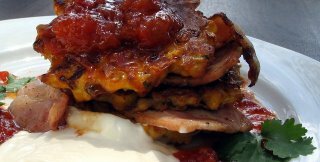 My partner ordered the corn fritter stack that came with bacon, relish and sour cream. She also ordered a side of avocado. The corn fritters were damned tasty. We were told that they oven roast fresh corn for their fritters and use "none of that canned corn rubbish." And because of this you can really taste the sweetness and freshness of the corn. I couldn't decide whether they were savoury or sweet, but regardless were close to perfection and very, very tasty. Better half finished her breakfast and I struggled through mine. While she gushed to the waiter how lovely her meal was I seriously contemplated asking him whether I could lie on their floor and take a breather for ten or so. Overall a great breakfast (with friendly attentive service) that's well priced spoiled by a late night and a few too many drinks. On my return I'll ensure that my state is not so fragile so that I can truly savour the delicacies at Mart 130(hey how clever is that its tram backwards!) Off to do some couch work. Went there for breakfast this morning, a crisp autumn day. Service was good and OK ambience BUT food was served cold as was the coffee and it really spoilt the effect of it all. They could have been more adventurous with the eggs and toast though. hmmm...Mart...I think the Full English and I have developed a love/hate with this place. In sum, the food is good and yes, noticably good vaulue. Once again, the paaaaain of waiting over an hour for my food. Small kithcen syndrome strikes again and it scares us away. If you can get your hands on the Good Weekend and Sport section, you'll probably just be able to distract yourself for long enough while you wait. Nice concept with the tram stop at your doorstep and pleasant views of albert park at the rear. However, my partner and I found the food to be less than average. There was nothing spectacular about it. The scrambled egg with spinach and mushroom was bland and the chicken turkish pide was salty and greasy. We were very disappointed considering the rave reviews it has received. And worse of all, we had to wait one hour for our food to arrive. This was not acceptable, considering the table next to us came 45 minutes after we did and their food arrived at the same time as ours. I wouldn't go back there again. It isn't worth a second visit - even to try their corn fritters! I think the more recent comments are indicative of the current situation at Mart. After reading countless reviews spruiking the great experience of Mart, I was severely disappointed. Over 45 minutes to get our food (other people that had ordered after us got their food before) and then when it arrived the toast was burnt and 2 corn fritter dishes we ordered were burnt too. Food was ok, but nothing spectacular. I think Replete keeps its crown for the moment! cute place - average food. 1/2 hour to get coffee..
1 hour to get the food..
maple syrup is in canadian labelled containers - a brnad which you can buy at coles - but - they are refilled with something that half resembles real syrup. Just returned from breakfast at Mart 130 after reading reviews. I'm another in the minority that had a disappointing experience. Service was nothing short of rude which I can handle if the food is good. Was keen to try the corn fritters after reading all about them but had to make a second choice given they couldn't leave out the corriander (unfortunately it's the one taste I can't tolerate). So I opted for my trusty favourite - the french toast. A good french toast and a good benedict is the true test for me and mart failed on the french toast. The second worst french toast I've ever had. On the positive side, the location is very quaint and the inside/outside area had a lovely ambience. But not enough for me to return. Great venue and vibe. Good selection of food. The Genovese coffee was very disappointing. They must have wiped the glass with a woollen cloth as there were small bits of wool on the top. Also it was very poorly textured and poured. They should take a leaf out of the coffee mastery from Batch or Gattica to learn how to make coffee. was so excited to try mart 130 after your 19/20 review. great position next to the trams and the tennis courts. we got a seat quite quickly, and ordered quite quickly but 2 breakfasts took about 40 minutes to come out. a bit disappointed you can't order fried eggs (only poached or scrambled) and disappointed you can't order chorizo as a side, even though it is a part of other dishes on the menu. bread was good. bacon was good. coffee was good. raspberry, coconut and white choc muffin was probably the best thing about my breakfast - crunchy on the outside with sour rasperries on the inside. even though the setting was nice and the standard of the food was good, won't be going back there as i feel the wait was a little long and they're a little inflexible with the menu. oh, and disappointed you can't get one of these famous corn fritters as a side, either! went to MART 130 by fren's recommendation... it met my expectation with such a highly recommended review.... lovely place, lovely food, relax yet attentive service. i had poached egg with avocado and bacon.. it was perfect, especially for the poached egg... medium well... yumm.. This is my favourite breakfast spot in London too - and I sometimes wake up dreaming of the corn fritters. Love it, love it, love it! Bill's in Surry Hills MIGHT be well renowned, but my boyfriend who used to fix their kitchen filters every week for a few years running said of all the kitchens in Sydney he serviced, Bill's get Number one for cockroaches & rats when he go in there at 4am each morning! How's that for an unforgettable experience. After much anticipation from reading all the awesome reviews, we were really disappointed with the food... They were served cold, with the corn fritters under cooked and the French toast was also not the best we've had by a long shot... So sad cause it's such a cool concept cafe being a tram stop and facing the park... Anyway, The Batch has way better food and never have to wait, so still our fav! Went this morning for breakfast. The food was amazing, I had the eggs #3 and the wife had the corn fritters. The flavours in both were so pronounced and amazing. We have been getting sick of the replica menu's that so many cafe's have these days. The #3 was better twist on the normal "chorizo baked eggs" that everyone seems to do. The coffee was good, not great, but nothing to complain about. The service however was the let-down. They were fairly busy, but that's not really an excuse. Getting a seat was chaos - i had to grab 3 different staff to get a clear explanation of the process, once our names were down though it was only 5 mins. It might be useful to have a "wait to be seated" sign of som description. They seemed to lose our coffee order (they said we were next when i queried, but i saw several people who ordered after us served first). It took an age for them to take our food order - maybe 20 mins after taking our coffee order. The food then arrived before our coffee (see previous comment) within 10 minutes of ordering. The sign that said "cash only" was tiny and hidden on the register, i HATE when you only find this out after eating. Had to run down the road to an ATM to pay. All up, the Kitchen really was the star performer, front of house needed some work.